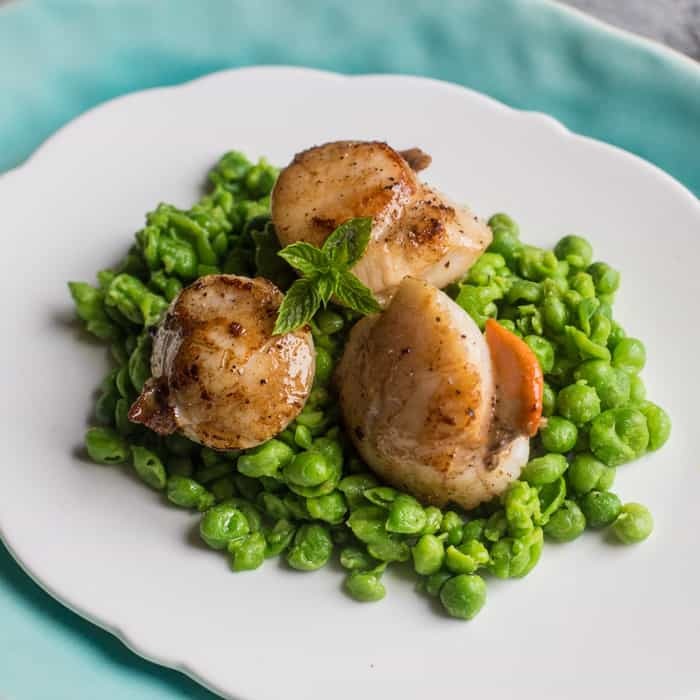 Scallops on Smashed Minted Peas. Healthy, speedy, fancy and uber-decadent, this is now one of my top five favourite ever meals I’ve shared here on hedgecombers.com. It’s a seafood loving foodies dream. 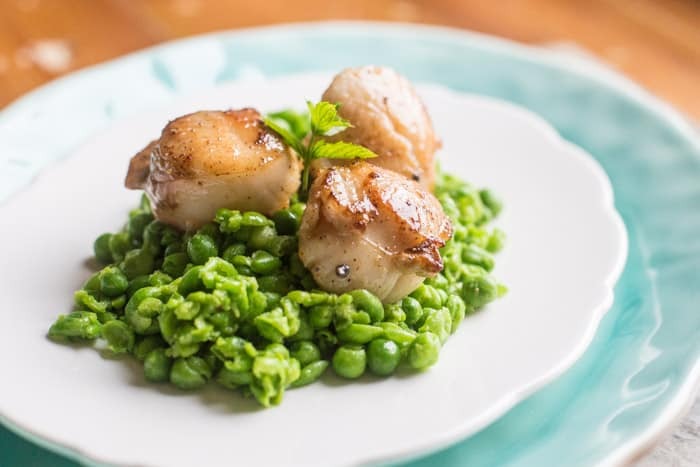 Ah man, can you believe I had no one to cook these scallops on smashed minted peas for? Jonny won’t touch seafood with a barge pole so I had to pull my Billy-no-mates trick of ordering 3 lonely little scallops at the fishmonger. Fancy dinner for one. Sad face. Hey ho, I’m sure his cheese and pickle sandwich was just dandy. Not wanting to bulk up with carbs I kept the meal simple which also kept it really, really quick. In fact from start to finish, this entire recipe took less than 10 minutes till the first bite was heading mouthwards. If I’d gone out to get a takeaway, it would have taken at least three times as long and probably cost three times as much! If you’ve never cooked scallops before, in my opinion, the key lies in getting your pan & oil smoking hot. This is much easier if you have a heavy (ideally cast iron) frying pan. Wash your scallops in cold water and dry on kitchen paper, before carefully laying into the hot oil. I say carefully as these puppies will spit, even though you’ve dried them. Once in the pan don’t mess with them for 2 minutes. Use a kitchen timer if that makes you nervous. Then flip them over to cook the other side for another 2 minutes. When you flip, you should find a sweet yummy golden crust on the side that’s cooked, and that crust is going to be packed with flavour. It’s also worth noting that very fresh scallops can safely be eaten raw, as sashimi. And they taste utterly divine served this way. So if you have a superb fishmonger, I would always aim to ever so slightly undercook them. The residual heat will keep pulsing through the meat once it’s out of the pan, and to over cook something this delicious would really be a sacrilege. Measure out the peas into a small pan and bring to the boil. Turn the heat off once they have boiled. Heat a little butter, ghee or oil in a heavy frying pan, cast iron is ideal. Wait until it is smoking hot. 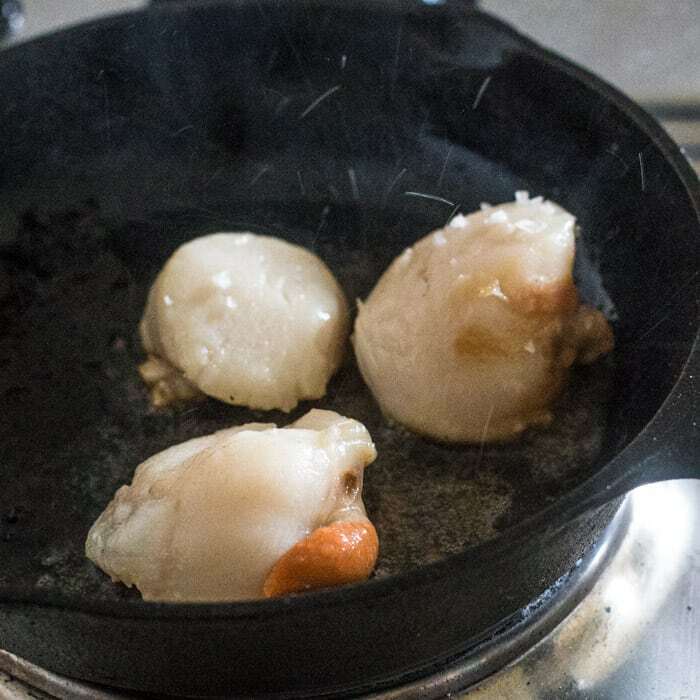 Wash and pat each scallop dry with some kitchen paper, then place carefully into the smoking hot fat. Cook for 2 minutes each side, or 3 if they are very thick. Drain the peas, add in salt & pepper, mint and one teaspoon of butter or ghee. Smash with a potato masher or fork and pile onto a plate. Top with the scallops and drizzle the pan juices over them and the peas. Deeelish. I adore scallops Janie and these look to die for! I’ve only had them in restaurants before but your fab recipe has made me want to give it a go now – yay for scallops! Aw, I’m so glad Lucy! Once you realise how quick and easy they are to cook, you’ll be hooked! What a super sounding recipe for one, I love it! I agree with the fresh scallops being eaten raw statement. I was visiting our local shellfish processing plant once where they’d just landed their scallops and I was invited to eat one, raw!!! Your photographs are just beautiful Janie and yes please to the smashed minted peas – yum!